How are broken elbows in children treated? Treatment for a broken elbow depends on exactly where the break is and how much the bones have moved apart (called displacement). 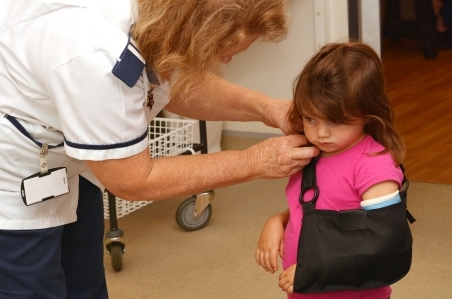 If the break is simple and uncomplicated, your child may simply need to have their arm put into a cast while it heals. However, there are some breaks, including those in which the pieces of bone are very out of place, that may need surgery. If your child has damaged nerves, blood vessels, or ligaments in their elbow, these may need to be treated as well. If your child's elbow heals in the wrong position, it may remain permanently crooked and your child may have limited movement in that arm. If a child's bones are still in the normal position they usually heal successfully with a cast or splint that holds them in the right position (called immobilisation). Splints provide less support than casts, but it's easy to adjust them to accommodate any swelling caused by the injury. Often a child's arm will be put in a splint to begin with, and then they'll get a cast once the swelling goes down. Sometimes the doctor may have to gently move your child's bones back into place before they get a splint or cast. This is called a closed reduction. If your child needs this, they'll have some form of anaesthetic before this happens. As your child heals, they may have some X-rays to make sure the bones are staying in place. If the pieces of bone have moved apart, your child may need surgery. There are two different operations they may have. In this operation, the surgeon moves the pieces of bone into the right place without making any significant cuts in your child's skin, and then inserts metal pins to hold them there. The pins are inserted through the skin, into the bone and across the fracture. Usually the surgeon makes a very small cut (less than 5 mm) to insert the pins and then closes this with stitches or steri-strips. You child will have a splint for the first week after their operation, then this will probably be replaced with a cast. The cast will be taken off and the pins removed a few weeks after surgery. Some injuries need an operation called "open reduction internal fixation" (often called ORIF). Open reduction means the surgeon needs to cut open your child's skin to move the bones, and internal fixation means the pins that hold the bones in place while they are healing are put in through this cut. This operation is usually used for injuries where the broken bone is sticking out through the skin (called open fractures), more complex breaks that a surgeon can't move with a closed reduction, and breaks that have also injured your child's nerves or blood vessels. What can I do to make sure my child recovers well? There are some things that you and your child can do to make sure they recover as quickly and well as possible. Your child should wear an arm sling for two to three weeks. In the first 24 to 48 hours, hold an ice pack against your child's elbow for 20 minutes at a time, to decrease pain and swelling. Your child may need simple pain medication. Give it to them regularly, but never exceed the recommended dose. Don't give anti-inflammatories such as ibuprofen, as they may slow down bone healing. Encourage your child to move their shoulder, hand, and fingers. Once the sling comes off they can start gently moving their elbow. Your child may return to sports such as swimming as soon as they're comfortable. However, they should avoid contact sports for six weeks after they stop using a sling.